AGUACATAN, GUATEMALA -- In Guatemala, strong Mayan culture exists to this day. The country has 11 million people with 23 spoken languages in addition to Spanish. Some of the Mayan languages such as Quiche, Kakchikel, Q'ekchi and Mam were widely spoken. Others were not. 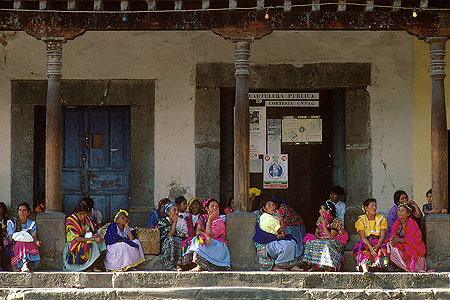 Awakateko, the Mayan language spoken in Aguacatan, was only spoken in the municipality and had a total of 17,000 speakers. While Mam and Ixil were related to it, they were no more closely related to it as a language than Spanish or French are to each other. I already arrived in Guatemala speaking Spanish and by the end of training, I had a pretty good grasp of the language. So when I arrived in Aguacatan after six months of being a volunteer, I set about to learn the local language. It was important for me to be able to greet people in their language and communicate with those people who only spoke Awakateko. Most of the people in town spoke Spanish, but in the outlying villages, this wasn't always the case, particularly with women and children. Learning the language was a struggle. They defined bees as wunaq chuq' or "insect people" because they worked with each other. This definition explained the fact that they as a culture worked together and therefore defined insects that were also social as being similar to them. Awakateko is actually a word that was given to their language by Spanish-speaking Guatemalans, they referred to their language as qa' yol or "our word" in English. They also referred to each other as qatanum, which means "our people" as opposed to being called Awakateko by Spanish speakers. During my free time I would spend time at the market with the old ladies practicing my Awakateko. In my first months, I hardly understood anything that was asked of me. I remember the first time that I responded correctly to a question. I had been away from the village for a couple of weeks and, upon my return, ran into a woman who I worked with. She asked me in Awakateko "ja pe kxul yaj" or "you've returned." When I answered "ja nu'ul" or "I've returned," she laughed. I really hadn't been certain that that is what she had asked but guessed. I asked her, "Did I not answer your question?" She said: "No, I'm laughing because you answered it right." My friend is traveling to Guatemala and I want to get her a unique gift. What is something you want from the USA being away from home that I could give her?